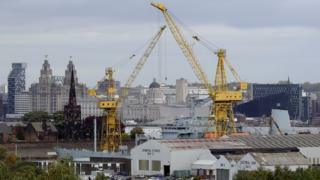 Some workers at shipbuilder Cammell Laird have voted to strike over fears 290 jobs could be axed despite the yard securing two big Royal Navy contracts. Last month it was announced that the Merseyside base would receive £620m to support Royal Fleet Auxiliary tankers. The Unite union said about 40% of jobs could still be lost by March. Nearly 80% backed strike action in a ballot in which three-quarters of members voted. A Cammell Laird spokesman said it would continue to hold talks with the union. He explained the firm “can have peaks in demand for skilled and semi-skilled labour, which is the nature of contract-based industries”. “However, as a result of numerous contracts entering the latter phases, and without certainty in the award of similar contracts in the immediate term, the company needs to address its cost base to remain competitive. He said Cammell Laird had agreed to look at a union proposal “proving they can avoid dismissing anyone until February”. Albie McGuigan, regional organiser for the trade union GMB, said: “This proposed redundancy of 291 highly skilled workers and support staff is a deliberate attempt to restructure through redundancy and place the future of a loyal workforce in peril. Shipyard workers recently built the £200m vessel RRS Sir David Attenborough, which includes a yellow submarine named Boaty McBoatface after an online campaign.